It’s officially Fall, can I get an amen? Even though it’s still 90 degrees here in Phoenix, the leaves are starting to fall and the sky has this…look to it that just makes me feel happy that summer is finally over. It means I can finally start making all those rich and delicious comfort foods that just don’t go well with summer’s 118 degree heat. 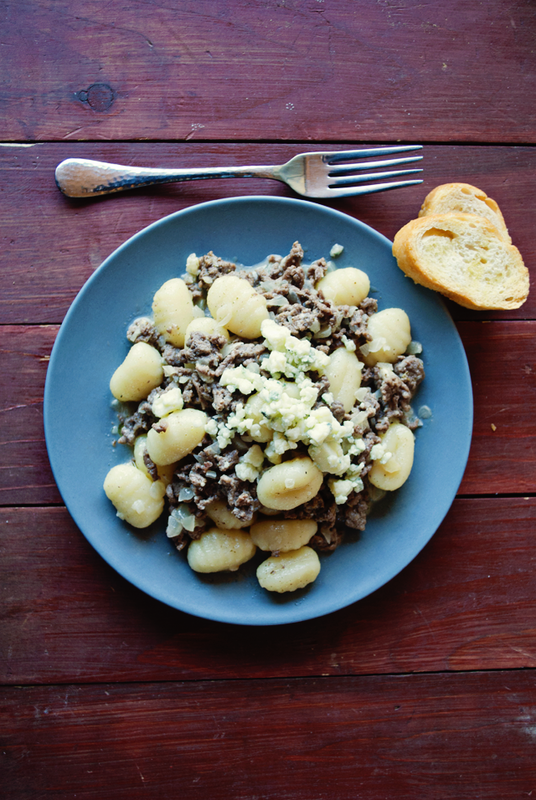 Gnocchi is one of my favorite fall indulgences. Not that you can’t have gnocchi any other time of the year, but it just has a quality to it that makes me enjoy it so much more during the cooler seasons. If you aren’t familiar with gnocchi, it’s a potato dumpling. 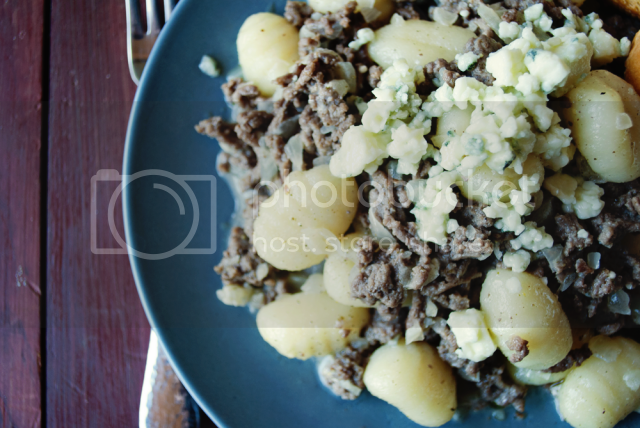 I fell in love with gnocchi about five years ago and I love to incorporate it into meals whenever possible, hence my Italian Meat and Potatoes. 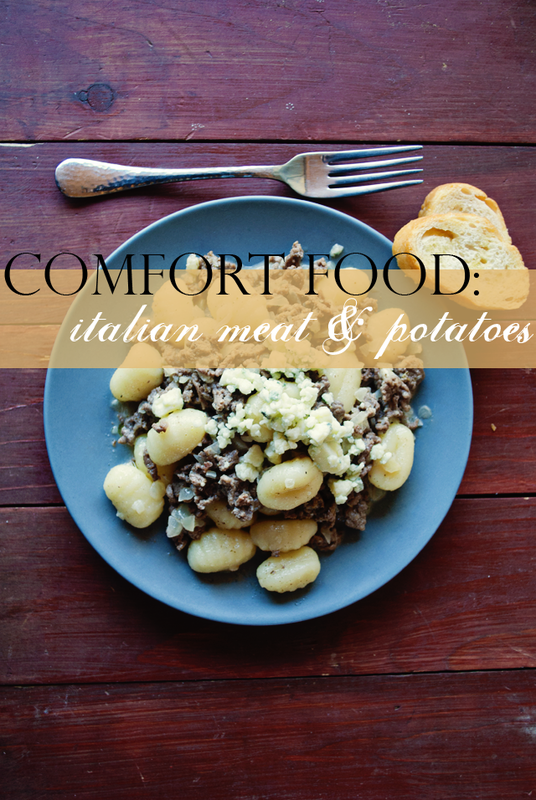 It’s a fun twist on a traditional meal concept that is sure to please everyone! 1 | Bring a 5qt pot of water to a boil over high heat for the gnocchi. Salt well. 2 | Heat the olive oil in a skillet over medium high heat and add the ground beef, seasoning with salt and pepper and browning until no longer pink, around 5 minutes. 3 | Add the garlic and onion to the pan and cook until softened, about another 5 minutes. 4 | Add the wine and stir for 1 minute, then add the chicken stock, sage and rosemary and stir. 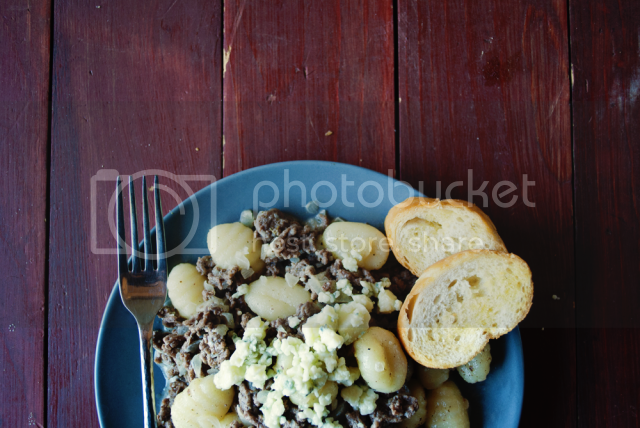 5 | Crumble the gorgonzola into the mixture, stir well then reduce the heat to low. 6 | Add the gnocchi to the boiling water and cook for 2 to 3 minutes, or until the gnocchi floats. Drain well and add to the skillet with the beef and cheese mixture. Stir well. 7 | Eat and Enjoy! This dinner can be prepared in less than 30 minutes, which I really love, especially with the crazy schedule my husband has. Serve it up with some crusty bread and a nice salad with a spicy vinaigrette and you’ll be golden! What are your favorite fall comfort foods? I’d love to hear about them! Linking up here, here, here, here, here, here, here, here, here, here, here, here, here, here, here, here and here. You are so welcome, it's wonderful to meet you! And I LOVE your name, by the way! Ashesela, so unique! Gnocchi is so yummy, and for being made from potatoes, they are incredibly light tasting, but will still fill you up quickly! Thank you for stopping by and I linked up with you and added your linkup to the list at the bottom of my post!